When designing a new craft grilled-cheese restaurant in Minneapolis, architects Nicole McIntosh and Jonathan Louie of Architecture Office had to get creative. First there was the issue of budget—it was small. In fact, they were doing the design pro bono. Everyone involved with the project was. And then there was the design: It would need to feel communal, open, and clean. No unfinished walls, no tight private spaces. All this for a grilled cheese joint? Not exactly. 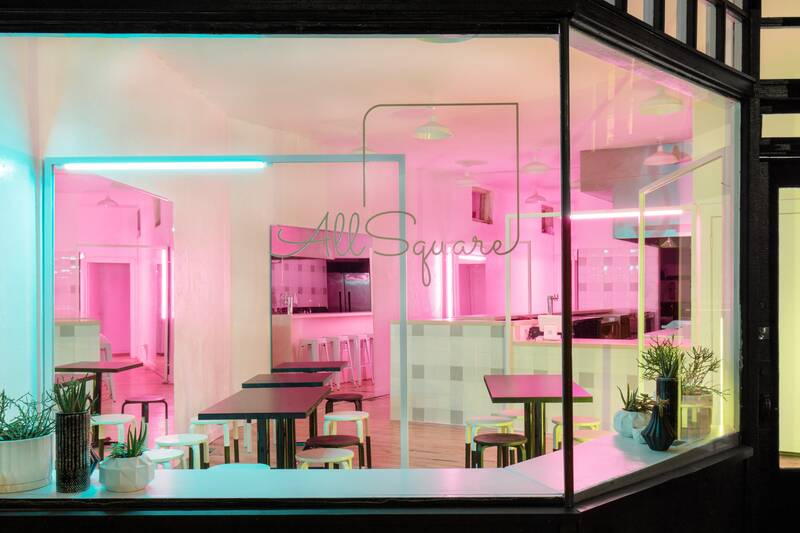 The name of the restaurant hints at a more socially conscious play by the project's CEO, Emily Turner, a civil rights attorney turned restaurateur: All Square, it would be called, as in debts paid. With a mission to end recidivism, the newly opened restaurant employs formerly incarcerated individuals in hopes of helping them "move forward into a bright, productive, and lucrative future." Plus, they serve grilled cheese, which happen to be square and delightful, as you probably well know. The design of the restaurant, a mix of open frames and colorful neon lights, is as inspirational as the establishment's aim. "It was amazing to be part of a team who believed in the mission, and to be able to contribute with our design by giving it a physical presence," says Nicole. "As educators and designers, it was a challenge that dragged us out of our comfort zone." The 900-square-foot restaurant's interior walls were all removed, turning it into a blank slate. Unfinished patches were shored up, the walls peeled back to cement and the wood floors refinished, plenty of white paint brought in, mirrors propped up—all essentially so that it would have the complete opposite vibe of a prison cell. Clean. Uplifting. Bright. Large white metal frames were erected to section off seating and serving areas (obviously, they're all square). "These things work to partition, frame, and unify the interactions and encounters between people in the restaurant,” Nicole and Jonathan explain. While simple, it wouldn't have to be bland. Inspired by artist Robert Irwin, tube lights were affixed to each of the metal frames, "the different colors placed in relation to one another to create an environment with multiple identities," Nicole says. The bulbs themselves were bought at Home Depot and wrapped with colorful theater gels, which is what lends the lights color. On one of Nicole and Jonathan's several trips to Minneapolis to help the project along, they assisted a contractor in installing the lights on site. "It’s gratifying to see how things come together," she says, proving as thankful for the experience as she is proud of the project. For more than one reason, it turns out: "At the same time the fellows were learning how to make grilled cheese, we were fortunate to get free samples."